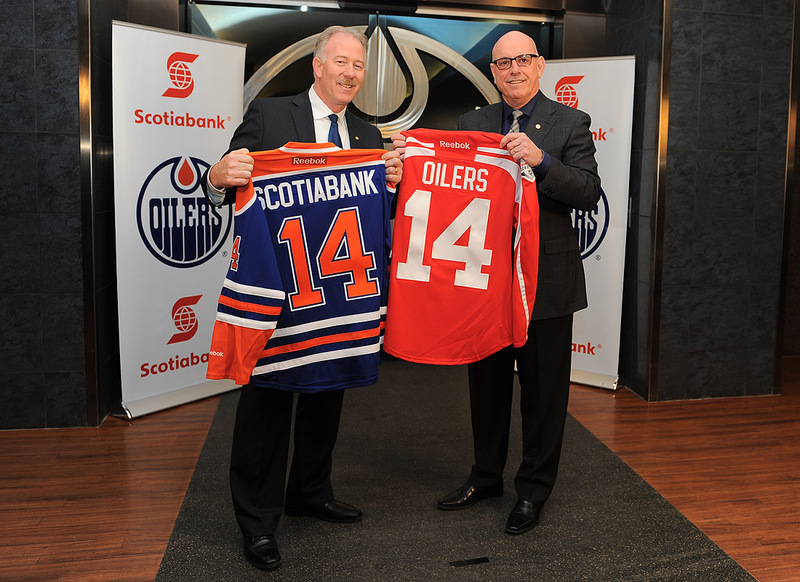 EDMONTON, AB--(Marketwired - January 21, 2014) - Scotiabank and the Edmonton Oilers are proud to announce a new partnership, making Scotiabank the Official Bank of the team. The partnership will focus on programs aimed at supporting fans, communities and grassroots hockey. 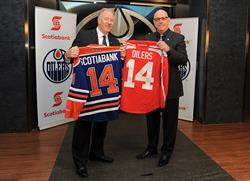 "The Oilers are proud to embark on this new partnership with Scotiabank on behalf of our many fans in Oil Country. We share Scotiabank's commitment to community and hockey at all levels," said Patrick LaForge, Edmonton Oilers President & COO. "With Scotiabank on board, Oilers fans are certainly richer than they think." "At Scotiabank, we think it's important to have a team to believe in; which is why we are thrilled to welcome the Oilers to the roster of teams and leagues we support across Canada. Our support ranges from over 5,000 community hockey teams and extends to the CWHL and NHL," said Laurie Stang, Scotiabank Senior Vice President of the Prairie Region. "We look forward to teaming up with the Edmonton Oilers to offer hockey fans some unforgettable experiences." To celebrate the new partnership, on January 22, 2014 Scotiabank will present Edmonton Oilers Captain Andrew Ference and Assistant Coach Steve Smith as the surprise special guest coaches at a local hockey practice for one of its sponsored teams. This team will be drawn from the 194 teams in the greater Edmonton area that are a part of the Scotiabank Community Hockey Sponsorship Program. Over the course of the six-year partnership, Scotiabank and the Edmonton Oilers will provide a range of fan initiatives and community programs including a community hockey focused in-game feature; and the Scotiabank Girls HockeyFest, a free hockey festival for girls aged 7-14 where they have a chance to improve their on-ice and off-ice life skills by learning from elite and CWHL women athletes. "We feel it's important to build teamwork and camaraderie in both sport and community, and we truly believe that everyone needs a team," said John Doig, Scotiabank Chief Marketing Officer. "We've been able to see first-hand how much hockey means to people from coast to coast, particularly at the community level. As Scotiabankers, we look forward to bringing our passion for the game to Edmonton and working with the Oilers to give back to their great fans." Scotiabank is the Official Bank of the NHL®, NHL Alumni™, CWHL, Vancouver Canucks®, Winnipeg Jets™, Toronto Maple Leafs®, Ottawa Senators and the Calgary Flames® whose home arena is the Scotiabank Saddledome. The Bank also has a partnership with the Montreal Canadiens®. Scotiabank has a long tradition of supporting hockey in Canada from local teams and minor hockey associations to professional players and leagues. Across Canadian communities from coast to coast, Scotiabank's Community Hockey Sponsorship Program reaches out to 5,000 minor hockey teams and leagues. To find out more about Scotiabank's hockey programs, please visit www.facebook.com/scotiahockeyclub. Scotiabank's Michael Wilson, Edmonton District Vice President and Edmonton Oilers CEO Patrick LaForge formally announce their partnership, making Scotiabank the Official Bank of the team.